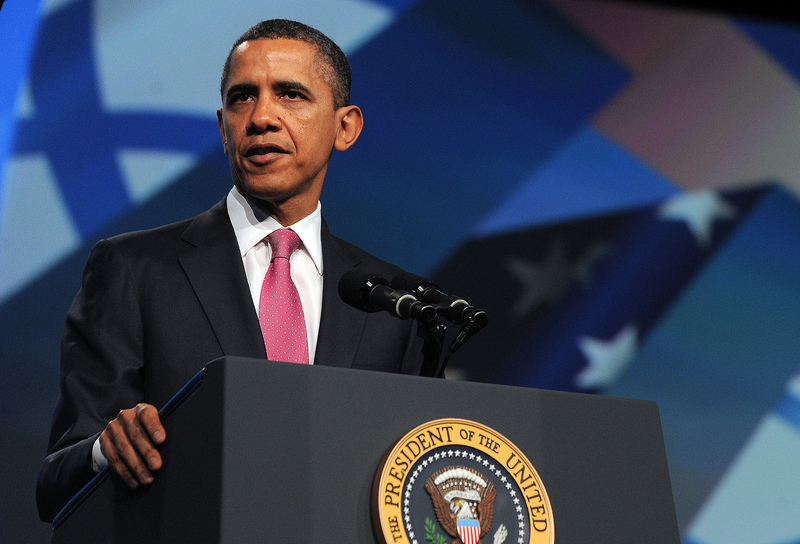 At the annual American-Israel Public Affairs Committee (AIPAC) conference in Washington, President Obama promised the crowd that the United States would stand by Israel, but he warned against a rush to war with Iran. The day before his meeting with Israeli Prime Minister Benjamin Netanyahu, President Obama attempted to assure the pro-Israel audience that the United States will not sit idly by and watch Iran build a nuclear weapon. "I have said that when it comes to preventing Iran from obtaining a nuclear weapon, I will take no options off the table, and I mean what I say," the president said. The president had a similar message for Iran: "Iran's leaders should understand that I do not have a policy of containment; I have a policy to prevent Iran from obtaining a nuclear weapon." But, the president urged more diplomacy, first, and to tame down any talk of military strikes against Iran. "I only use force when the time and circumstances demand it," he said. "Already, there is too much loose talk of war." The president urged continued use of sanctions, travel restrictions and efforts to choke off the Iranian regime, but he said that the United States is willing to take military action. "Of course, so long as Iran fails to meet its obligations, this problem remains unsolved. The effective implementation of our policy is not enough - we must accomplish our objective," the president said. Mr. Obama also reaffirmed the United States' support of Israel and that it respects Israel's right to dismantle Iran's nuclear program through force, which has been a point of contention between Mr. Obama and Israeli Prime Minister Benjamin Netanyahu. Iran's leaders "should not doubt Israel's sovereign right to make its own decisions about what is required to meet its security needs," the president said. Speaking in Canada, Prime Minister Netanyahu said he was pleased with the president's remarks. "I very much appreciated the fact that President Obama reiterated his position that Iran must not be allowed to develop nuclear weapons and that all options are on the table," Netanyahu said. "Most important of all, I appreciated the fact that he said that Israel must be able to defend itself by itself against any threat." The president and prime minister have had a rocky relationship over the Israeli-Palestinian peace process, and Iran is the latest issue where the two disagree. Netanyahu has wanted the United States to take a stronger stance and recognize Israel's right to strike Iran. The two leaders will meet at the White House Monday for discussions expecting to revolve around Iran, which both countries say is making progress toward a nuclear weapon. Meanwhile, the conference does have its detractors. About 100 protestors demonstrated outside the conference site and hacker activists group Anonymous, claimed credit for taking down AIPAC's website Sunday.